After its release in 2006, the films “Death Note” and its sequel “Death Note: the Last name” created a huge sensation. And after 10 years, the newest chapter, “Death Note: Light up the NEW world” has finally been unveiled. It’s hard for many to believe that it’s already been 10 years. The story of “Death Note” started off exploring the question of “what would you do if you obtained the God of Death’s notebook and had the power to kill a person simply by writing their name?”. And in an era of questionable legislation such as internet surveillance and anti-terror efforts, this premise seems anything but outdated. From the original comic to a live action film, a TV anime, a TV drama, a stage play, a video game and various other mediums, the story has continued to adapt and exist in today’s world. The main reason the story has thrived is, of course, the appeal of the original comic/manga, which sold 30 million copies. But it was the film adaptation that helped successfully spread the story to an even larger audience. This film franchise has had a huge impact on the modern Japanese film, pushing the boundaries of what the traditional Japanese film should be. The pursuit of realistic facial expressions over the past 10 years. Making us feel as if 10 years have indeed passed, a new generation of actors, Masahiro Higashide, Sosuke Ikematsu, and Masaki Suda, help bring this new world to life. But advancements in CG have also played a role. 10 years ago, having CG created death gods act alongside real life actors was seen as a risky experiment. But due to remarkable advancements in CG technology, nowadays viewers are accustomed to seeing CG used in various ways in film. “First off, we didn’t want the quality of our CG to look the same as 10 years ago. So one of the biggest differences with this film was the choice of Shinsuke Sato as the director. 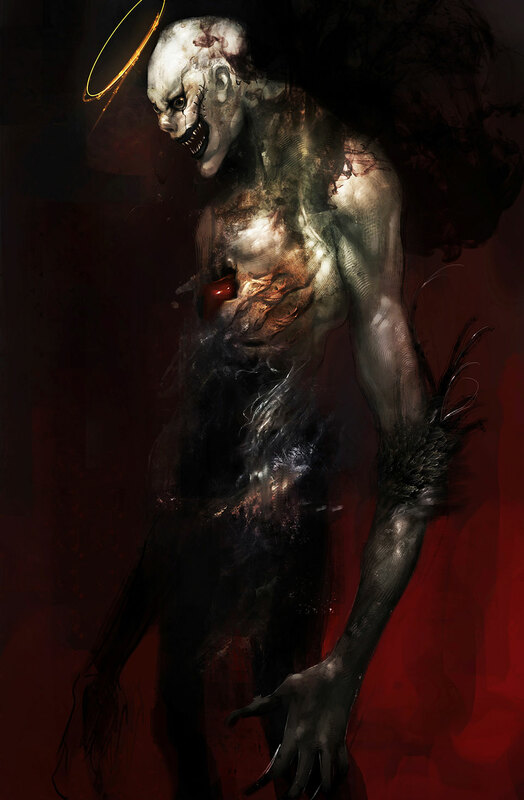 The world of Death Note was constructed according to his vision and the first request was changing Death God Ryuk’s design.” said Nobuhiro Suzuki, CG producer of both the first and the latest film. 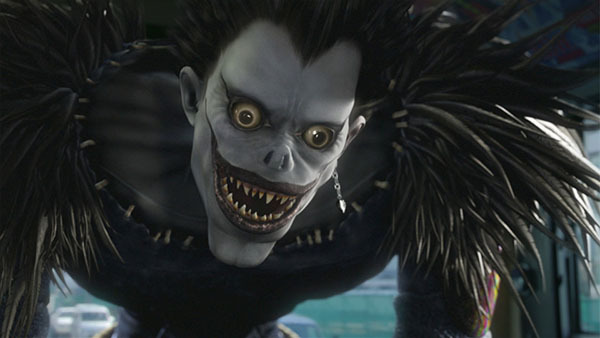 The Ryuk from the previous film was created in CG with a character design stemming directly from Death Note author/creator Takeshi Obata’s original drawing. Actors Tatsuya Fujiwara, who plays Light Yagami, and Kenichi Maruyama, who plays L, similarly also used the original manga as the basis of their character studies. So in the end, the previous film felt just like a manga. This gave birth to a innovative film at the time. But with this new film the goal was to create realistic facial expressions and make it feel more like a live action film. To make things “realistic” we did things like add fuzzy hair to Ryuk’s skin and wrinkles to model, things we couldn’t do in the film 10 years ago. Another big change was the introduction of facial capture, which synced Ryuk’s facial expressions to Shido Nakamura’s facial performance; whereas, 10 years prior, animators worked on facial expressions by hand. CG lighting technology has also advanced so we’re able to read the lighting setup from the actual live action shoot and apply it to the CG characters so that they were lit in the exact same way. I think this is what gives the death god a much more incredible sense of presence. 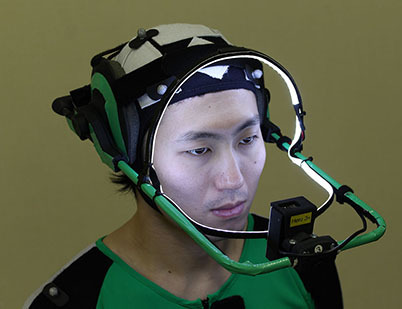 “Facial capture” is a technique where you film an actor’s face during his performance and capture the data related to his change in his facial expressions. 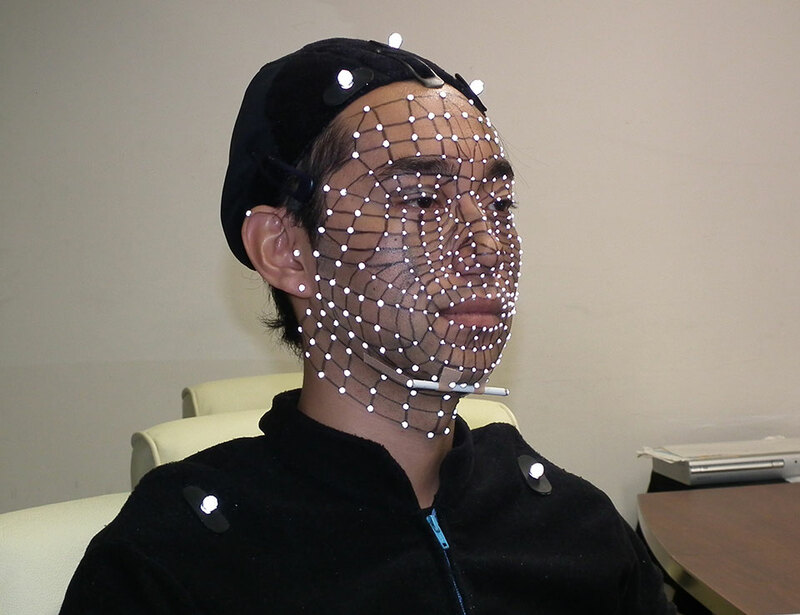 Many are aware of a technique in which many markers (small points) are attached to an actor’s face allowing you to read minute changes in the facial movement. But with the latest technology we can film a face as-is, without any markers, and capture facial expressions as data. This has allowed artists to also read eye movement data, which was previous impossible using the marker technique. With this tool, the Death God’s performance holds up even in a close-up without any sort of strangeness when seen next to real-life actors. When you watch a Hollywood film, CG created characters such as like animals, masked heroes, and alien creatures are abundant but examples of realistic, human-like facial expressions from such CG characters during conversation are rare, even today. This film’s Death Gods blend so seamlessly into the drama that it makes us forget the fact that they are CG. At first, the director thought about using dolls and puppets through a combination of CG and sculptures where they’d only have shots of the shoulders and arms. But in the end, I was glad that we were to convince the director that it could all be done using CG. Advancements weren’t just made on the technical side. 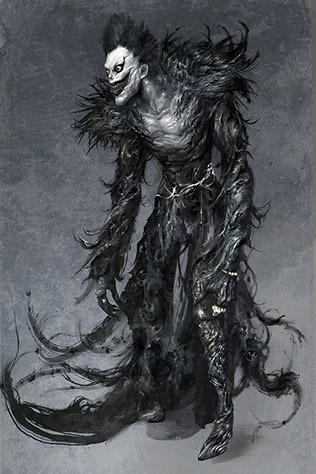 We also rethought Death God Ryuk’s design. 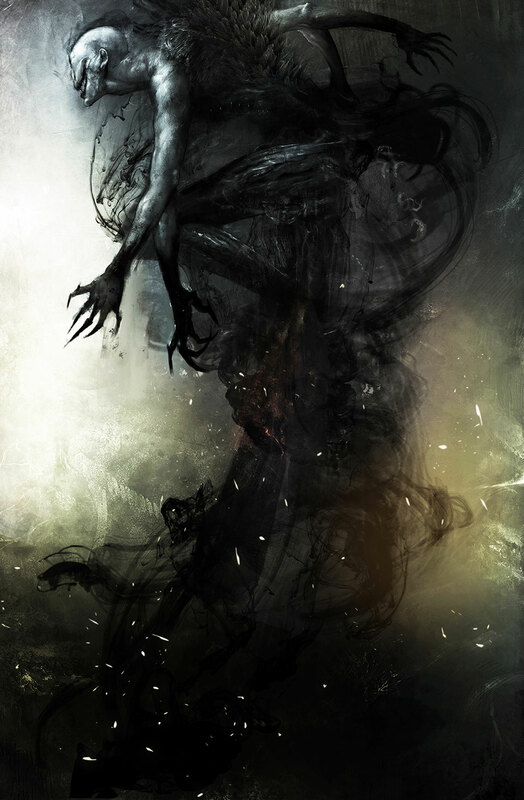 In line with realistic concept for the film, the team aimed to create visuals darker in tone than that of the original manga. Since the film’s story was not based on the original source material, the team decided to create concept art using completely different imagery from the previous film. Eri Takatsu was the concept artist for the Death God characters. After graduating from art college, she primarily worked freelance doing background art and characters for video games and had no 3DCG or film experience. But after seeing her potential and sensibility through her past projects, Digital Frontier hired her and after half a year Takatsu was chosen as the main concept artist for this film. I kept working despite the fact that I had no knowledge of this industry or how to properly approach character redesigns. At first, I turned in a so-so design, which simply took the Ryuk design from 10 years prior and increased the quality of the design’s skin textures and clothing. After this, the CG producer Yusaku Toyoshima told me, “It’s OK to completely forget the manga and previous designs of Ryuk. I want you to freely depict what you think the Death God should look like.” After hearing this, I felt completely free and submitted these 3 different designs. 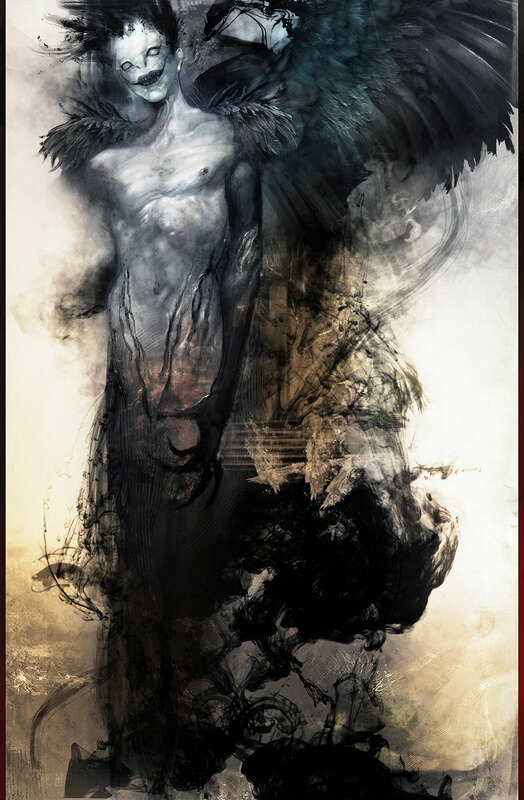 Slightly departing from Ryuk’s original design, I created one design where he had completely a baldhead; his heart was visible and he wore a halo even though he was a Death God. I wonder if I had too much freedom because when I showed it to Toyoshima-san, he said that that design might be a bit questionable (laugh). For the most part, the designs were in line with what the producer Toyoshima had hoped for. Her designs were altered slightly for the actual production, of course. But because the team started with a design completely different from the previous film, they were able to better create a character that fit the new world of the film. Using Takatsu’s free interpretation as a basis, the team requested adjustments to the design concept little by little to restore Ryuk’s essence. Afterward under Toyoshima’s direction, we worked on bringing out Ryuk-like features such as his chin shape and the springiness of his muscles. Ryuk’s features are very widely recognized, but since I initially designed with freedom I was able to erase some of the typical Ryuk features. Typically, Ryuk is known to be physically ominous with vague and carefree character tendencies. But in this film they wanted to give him a more serious look so we went for a darker design and filled in all other details with a similar serious tone. Darker character design have been started to become a trend even in American comic book films. For instance, with the Batman suit from the poppy, catchy look of the 60s TV show to the Tim Burton-helmed film series in the 90s the Batman’s visuals have gone completely towards a darker tone. In the “Dark Night” series this tone continued but imagery became even more realistic with almost no warmth. As a whole, visuals have also evolved with generations. Even the traditionally wholesome, straight-laced Superman now wears a suit with a darker color tone and he is depicted as a hero in agony. This trend probably stems from the effects of worldwide eco-political gloom. But the trend most likely comes from the idea that in order to survive through generations, manga/comic book characters grow with their readers. So it’s inevitable for them to transform and develop a more serious tone. After existing for 10 years, Ryuk’s design has also adopted a darker tone and has been reborn as a character that is much more realistic and stylish.